As we started the race, the 7:26 per mile pace felt very comfortable, and my heart rate was well under control. There is a fairly significant hill at mile 2 that got me breathing heavy, but after that it was mostly gently rolling hills through mile 19. My splits through the first 19-miles were almost dead-on perfect, and my confidence was rising with each mile. It was really cool to pass the half-way point, 5-minutes under my current 1/2 marathon PR. The crowd support was also fantastic. Not the 1.5 to 2+ million spectators of Chicago, New York or Boston, but the 300,000 that came out were loud and very supportive. More on this down below. As we crossed the Mississippi River during mile 20, my legs began to feel extremely fatigued, but I still thought I could keep it going. I was around 30 seconds ahead of my goal pace. When I reached the 20-mile marker, there was a big, inflatable “wall” crossing the road, which could not have been more appropriate, because this was where the big hill started. I kept my pace going through the first half of the mile-long hill toward the 21 marker, but somewhere during this climb, I bonked hard. Somehow I kept my legs moving to the top of the hill as we turned onto Summit Avenue, but I had nothing left. I was still on-pace to qualify for Boston (though my 30-second bank was gone), but my legs felt like they weighed 1000 lbs. each. I kept pushing on mile 22, but my pace was over 8:00 minutes, and I was running as hard as I could. There was just nothing left, and both of my quads began to cramp (never happened to me before). I started taking 1-minute walk breaks during each of the remaining miles just to try to finish the race, and to be able to set a new PR. As I saw the 3:20 pace group pass me at mile 24, I knew that officially my quest for Boston had fallen short. Even with the disappointment, I held my head high knowing that I went for it, and gave it Everything I had. Those last 5 miles were ridiculously painful, but I’m glad that I pushed through and finished. As we crossed the hill toward the last 1/2 mile of the race, I gathered up everything that I could, and ran strong to the finish line. 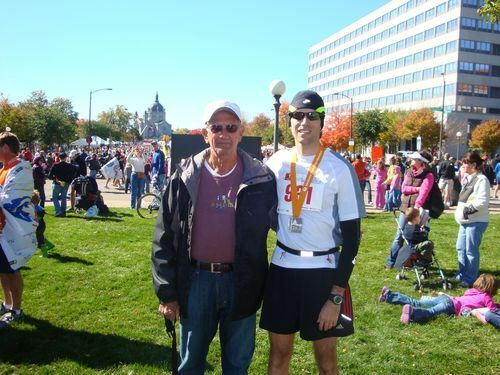 The crowd was incredible, and my family was there to cheer me on. 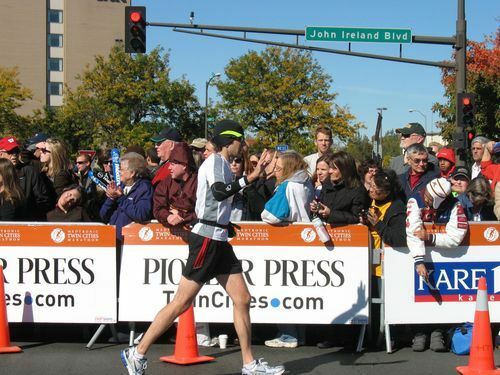 My finish time was 3:25:38, a new PR by 14-minutes. I probably had a 3:20 in me if I had not gone for the 3:15, but I have absolutely no regrets. Glad that I went for it, and super grateful for all of those that gave me so much encouragement before and after the race. A huge shout out to the JSRC and especially Nathan Wright and Paxton Baker for their support and encouragement. It was really neat to look back at the Twitter exchange between Nathan and Paxton following my splits online. I’m also thankful for my family being with me. They all knew my goal, and were incredibly supportive even though I fell short. Looking back at my run, I know there are a lot of lessons to be learned. For one, P90X is a killer cross-training program for marathoners. It is difficult, and time demanding, but will really supercharge your running performance. I plan to continue P90X, and integrate workouts from two other Beachbody programs, P90X+ and Insanity. Two, I’ve really got to work on my pre-race and in-race nutrition plan. There is so much contradictory advice out there, that it is hard to know the right strategy. I have generally gone with GUs and water during the race, but this time I did GUs and sports drink trying to get as many carbs as possible. However, it was obvious that I ran low on glycogen around mile 21. If anyone has any tips, I’m all ears. Three, the next time I go for a BQ, I either need to find a race without a big hill at the end, or I need to be better prepared for climbing with tired legs. I’m registered for the Rock n’ Roll San Antonio Marathon in 6 weeks, but am having a hard time thinking about going for 3:15 again so soon after the MTC. The Race: Overall, I would give that race organizers an outstanding “A+” – The course is exceptional (see more below), and the crowd support is amazing. 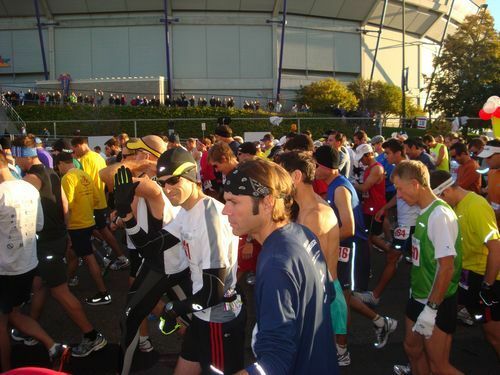 Though this event is roughly 1/4 to 1/2 the size of the World Major Marathons (Chicago, Boston, NYC, etc. ), the course is spectator lined almost from start to finish, and they are LOUD! Great signs, and very running savvy (no “You’re almost there!” screams at mile 15). All full marathon finishers receive a Brooks technical long-sleeve t-shirt (very high quality). The finisher’s medal is cool and unique. There were lots of aid stations, and all had water and PowerAde. Like most big races, the water and PowerAde were in different cups, making it easy to distinguish. My only complaint about the aid stations is that they are a little sparse at the beginning (every 3 miles or so). I’m also not a big fan of PowerAde (too sweet), but this is just a personal preference. The volunteers working the aid stations were fantastic. All were very vocal about whether they had PowerAde or water. The mile markers were elevated on both sides of the course, making them easy to see, and all included split times. The finish area is very nice, with plenty of room for the runners to move around. 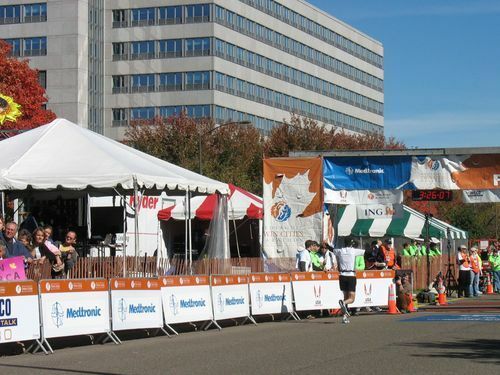 They have heat blankets, lots of food and drink, and free Caribou Coffee for runners and spectators. The bag check location was clearly marked at the race start and finish. 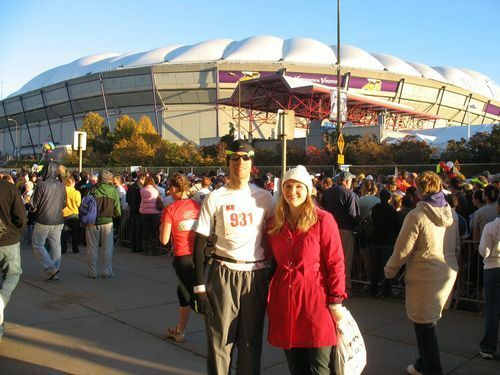 Access to the Metrodome at the start was also a great perk. Nice to escape the chill and have access to the restroom facilities. The race also never felt congested. There was lots of room on the course, and I never felt like I had to break pace. Some of this might be related to starting in Corral 1, as there seemed to be a LOT more people in Corral 2 at the start. 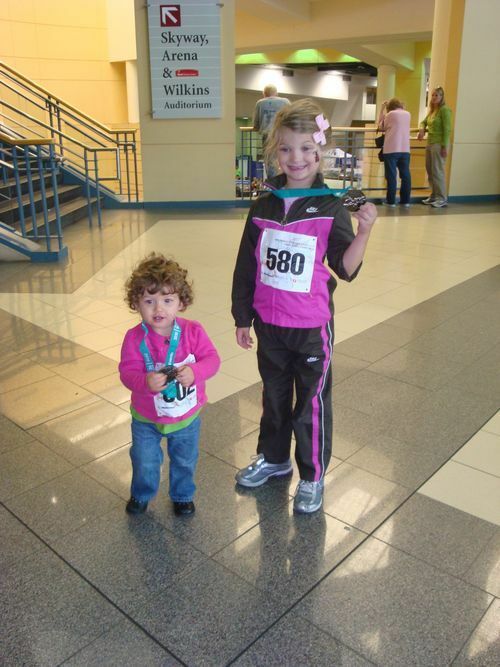 The fact that the weekend includes multiple kid’s races (diaper dash, toddler trot, 1/2 mile, 1 mile), a 5k, 10k, & a 10-mile race makes it a great event for the whole family. 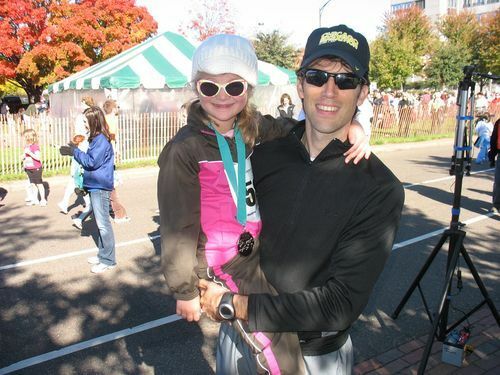 This race was special because my oldest daughter Kate did the TC Kid’s Marathon (her fourth), and youngest daughter Sara did the TC Toddler Trot. It was also neat to have my wife Olivia and both of my parents there as well. The Course: This race was dubbed “The Most Beautiful Urban Marathon in America” by Runner’s World, and has since been trademarked by the race organizers. While I can’t vouch for all of the other “Urban” marathons, I’ll have to say that the MTC is STUNNING! Definitely a bucket-list type marathon. The race starts out in downtown Minneapolis, right beside the HHH Metrodome, and winds through town for the first 2 miles. After that it is just beautiful fall scenery as the course passes by lakes and through parks on it’s way to the Mississippi River and St. Paul. 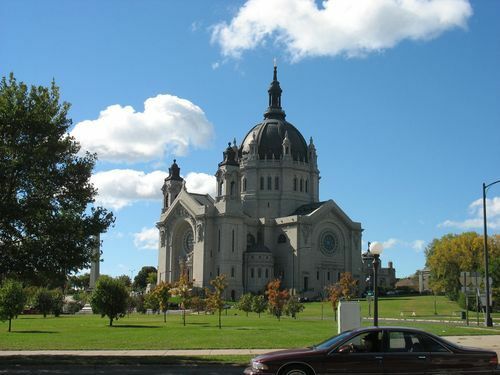 Once the course crosses the river into St. Paul, the beautiful scenery continues through a stunning residential area that is filled with old, beautiful church buildings. The most stunning of these is the St. Paul Cathedral at mile 25.5, just as the course crests the hill toward the finish line. 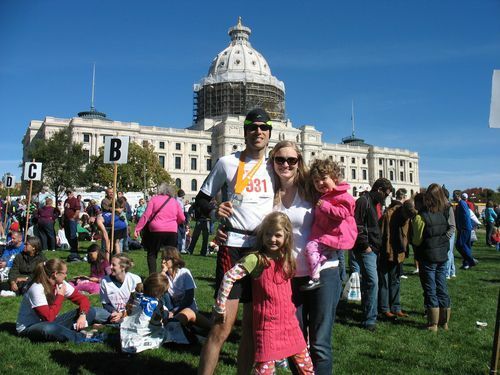 The finish is straight toward the State Capitol building in downtown St. Paul. As for elevation changes, the first 19-miles or so is mostly gently rolling hills, with one significant hill at mile-2. The incline up the bridge across the Mississippi is just the appetizer for the mile-long ascent up to Summit Avenue at the end of mile 21. While there are more significant hills where we train in Tennessee, this hill is demoralizing at it’s location in the race. Once on Summit Avenue, the terrain begins to roll again, though it is a little less gentle than the first 19 miles. The last 1/2 mile is straight down-hill to the finish at the State Capitol building. Incredible crowd support throughout the course. Access to the Metrodome at the start line.